Recumbent bikology in the urban jungle. : Hase Pino. Four thumbs up. 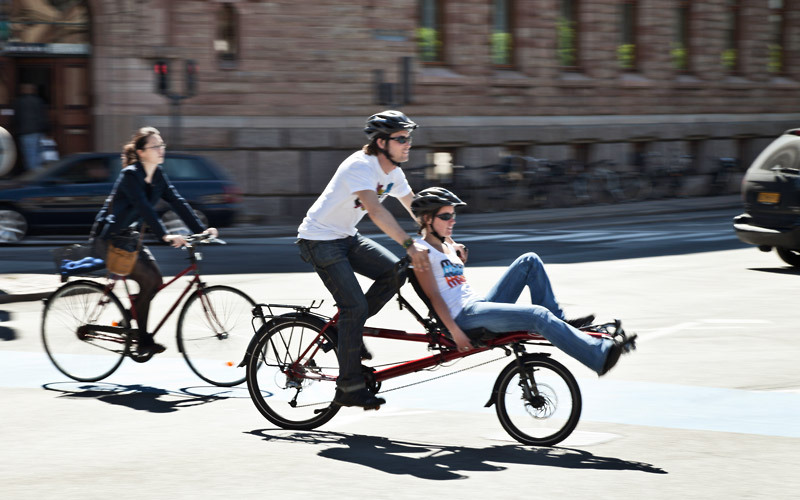 The new Hase Pino semi-recumbent tandem arrived in the shop the other day. On Saturday I had the chance to take it out for a test ride. My friend and I treated ourselves to a casual 65-mile hilly ride from my place near the Brooklyn Museum of Art up to the Alpine Picnic Area at the north end of the NJ section of the Palisades Park. Wish I had a photo, but you can't really take a picture of yourself riding a bike. Neat bike. I've ridden a fair number of tandems and there are several points that make this one stand out. - Both captain and stoker have a great view of the surroundings; there is no "obstructed view seat." This is a wonderful feature. - Stoker has an semi-independent pedaling system, so he/she can rest when desired. - Bike is easy to handle by the captain. I anticipated needing to take some time to master the handling, but it felt very natural from the get-go. No learning curve at all, not even to take tight U-Turns. - Very stiff frame, steering system, drivetrain and wheelset. Everything felt tight and responsive. - It's easy to pick up this big bike with one hand and maneuver it down stairs and through doorways. - Handlebars can be positioned for comfort. The position I carefully chose when we started began to feel uncomfortable at about mile 30 or so. It was a simple and effective process to reposition the bars to achieve a more comfortable hand position. - High quality drivetrain. The rear derailer is great; no comments there. The front derailer shifts better than I anticipated while pedaling. I like to lighten up my pedaling force when I shift a front derailer. On a tandem it can be hard to coordinate that with the stoker. I was pleasantly surprised that the front derailer shifted just fine, even with the stoker still pedaling normally. - Front recumbent seat is nice. - As a longtime bent rider I've become spoiled by comfortable seats. If this was my bike, I'd change the captain's "stock" seat. No surprise there. It's not bad, but I'd change it for a Brooks saddle or an ISM noseless saddle. Still, it's a standard frame-type seat and it'll never be as comfortable as a recumbent seat. - The stock "handlebars" for the stoker are good quality but are merely bar-ends and, as such, are rather minimal. Larger bars would be nice. - I'd carry a Camelback-style water bladder if this was my usual ride, instead of relying on a frame-mounted water bottle. While there are threaded bolt holes in the frame for mounting a water bottle, it'll take some practice to feel comfortable grabbing a bottle from this location. Even after 65 miles I still found it tricky. You'll also need a seat-mounted bladder system for the stoker, but that's normal for a bent-type seat like this one. - If you want a mirror, a helmet-mounted mirror works best. I installed a handlebar-mounted mirror, but it was unhelpful. - The stock bell on the captain's handlebars is too quiet. I'd like something louder for the city. That's no big deal and isn't worth mentioning, really. The challenge is where would you install a loud bell that isn't directly next to the stoker's ear? So, a quiet bell is useless, but a loud bell unusable. Tough one. - The captain's stock handgrips became uncomfortable after a half-day of riding in spite of all my adjustments. I'd install Hase's optional Ergo handgrips and, in addition, install an ergonomic grip like those from Ergon. - It might be only me, but I could not figure out how to pedal in a standing position (as captain). There isn't enough knee room. There's a nice photo on the Hase website of a guy pedaling a Pino in a standing position, but I can't imagine how he pulled that off. I had to stay in the saddle.